As you gear up for the winter with new sweaters, coats, scarves, and gloves, don’t forget to protect your skin with the proper cleansing and lotion products! Your skin has a big job to do. It’s your largest organ, covering your entire body, and it’s responsible for keeping a protective barrier between you and the outside world, as well as keeping a vital moisture balance inside your body. Lots of things can weaken this protective barrier, like drying cleansers, winter weather, low humidity and some skin conditions. Once that happens, you may have more dryness, itching, redness, flaking, and eventually painful cracking of your skin. At best, this process can lead to a rough, red, unpleasant skin texture. At worst, severely damaged and inflamed skin can get out of control and provide a portal for bacteria. accént® products are also mild and gentle enough to be used as often as desired anywhere on the face as well as the body. They are paraben-free, propylene glycol-free, gluten-free, non-irritating, non-drying and non-comedogenic (will not block pores). With only one wash and one moisturizing lotion for daily use, accént® is a cleansing and moisturizing system that couldn’t be simpler. 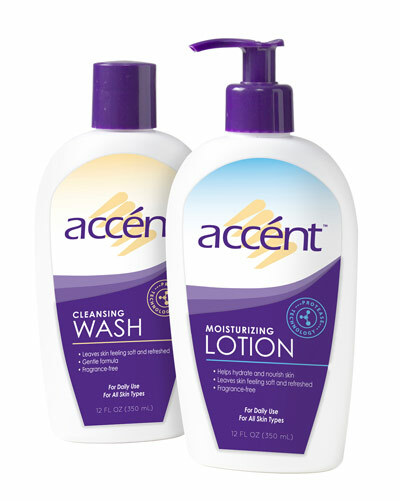 You can find accént® products at your local CVS/Pharmacy and at Drugstore.com. My dermatologist recommended this but I’ve never had so much trouble buying anything! Went to my CVS in Clinton, SC today. Did not have it and said they could not order it for me. Doctor gave me samples and I really liked it but can’t seem to buy it! Any ideas? Drugstore.com does not have it either! I would like to get the accent cleansing wash.
write awesome posts but you should rank your page higher in search engines.